JD Fresh also took advantage of the opportunity offered by this exposition to purchase the first shipment of cherries from Australia. 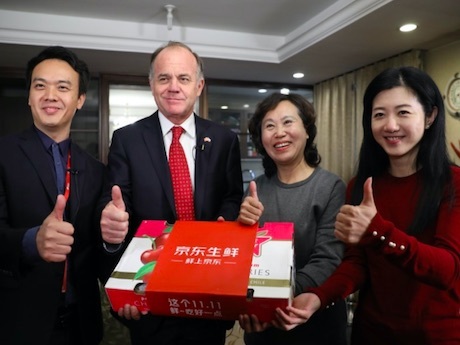 This is also the first time that cherries from mainland Australia are directly imported into China. The cherries travel from Australia to China in less than 12 hours with the guarantee of JD Fresh. The cherries take less than 48 hours from the orchards in Australia to the hands of consumers in China. Data shows that the value of agricultural products imported into China reached 120 billion USD in 2017, and preliminary data shows that agricultural import increased even further in 2018.